The nice folks at Magic Chef are offering to send one of these beauties to an OurKidsMom reader! 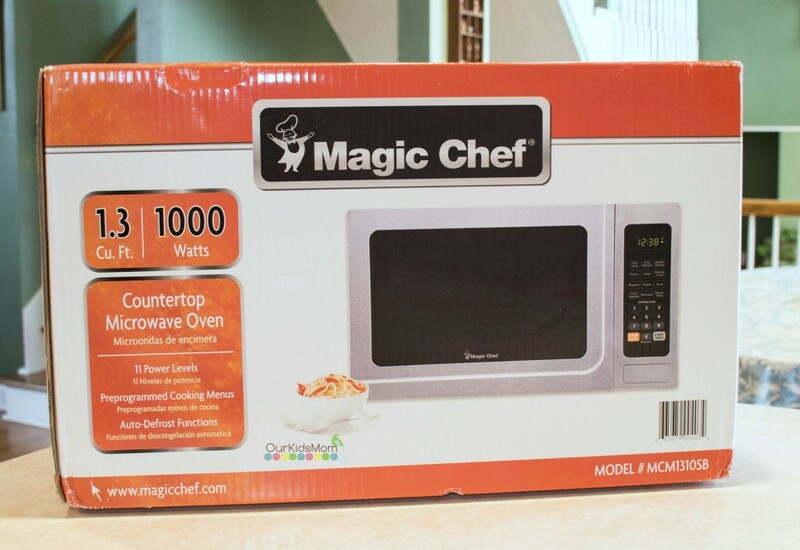 ONE OurKidsMom reader is going to win a Magic Chef 1.3 cu. ft. Countertop Microwave Oven ! This giveaway ends at 11:59 PM EST on May 8, 2015. OMG I need this so much! We just went to Best Buy to look at new appliances including a new stainless counter microwave. I love this one because it’s not too huge, like most of them are! I’d love to have the 3-Gallon Glass Bowl Convection Oven. Very neat appliance. I like the Customize Cooking with the Choice of 11 Power Levels. I like this microwave because it is a great size. Doesnt take up too much room but has a ton of different power levels so its not whimpy. My son is getting ready to move out into his own place and this would be a great first time apartment/house present!! I like the 3-Gallon Glass Bowl Convection Oven. I like the 6-Place Setting Countertop Dishwasher! This is great! I need an appliance refresh! I learned that it has 11 power levels! I found a countertop ice maker I would love to own. My favorite feature is that this allows Customize Cooking with the Choice of 11 Power Levels and Defrost settings. I like the 30 lb portable ice maker. 3-Gallon Glass Bowl Convection Oven would be nice to have. I love how compact it is and that it’s made for the countertop. This would help me by allowing my kiddos to use it! I love that you can Customize Cooking with the Choice of 11 Power Levels. I would love to have the 3-Gallon Glass Bowl Convection Oven and I also would love to have one of the portable ice makers. That would be really nice to have during the summer. I need a microwave, ours is rusting. Besides this, I would love to have the ice maker, we go thru a lot of ice in the summer. I Love the Express Cooking Function for Quick Cooking & Reheating. Thank you for the wonderful giveaway. I love that this microwave has 11 power levels. My daughter is going off to college this fall, as well. This would be perfect for her. I learned it has 11 power levels. I’m not sure I need that many but that’s pretty cool. I like that it has 11 power levels. I love that they have the parts linked off the main item page; if anything went wrong it would be easy to know exactly what you need! I like the Magic Chef -3-Gallon Glass Bowl Convection Oven! Looks like it can cook food very fast! I like the Convenient Preprogrammed One-Touch Cooking Modes. I would like 6-Bottle Countertop Wine Cooler. I like the size….big enough to fit a plate…but not too big to take up your whole counter! I like the 178-Can Beverage Cooler. I like the 30 pound Portable Ice Maker. I entered the $50 Visa Gift Card & 2 Pack SmartPhone Pockets giveaway. I’d love to have the 1.7 cu. ft. Mini Refrigerator in black. 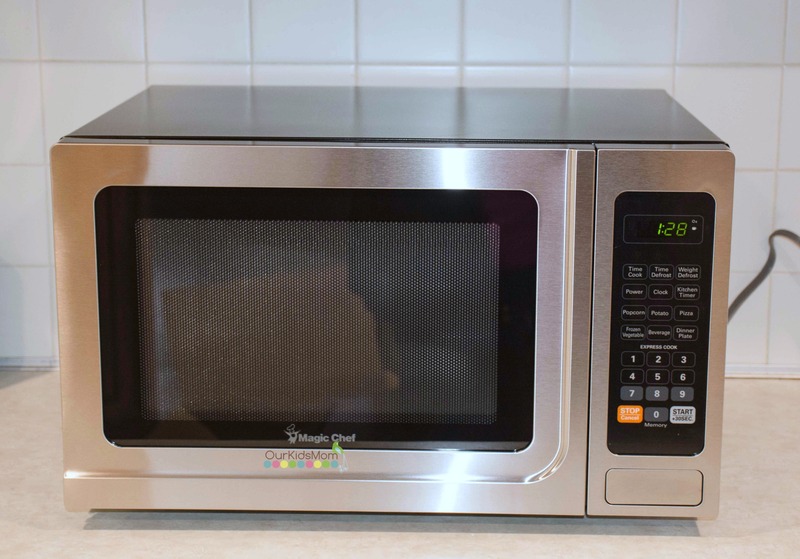 First, this is such a great microwave, second, I love that there is a “recipe of the week” (bookmarked for future reference) and thirdly, I would love to have the 6.9 cu. ft. Chest Freezer which would be a great help when I try to go bulk shopping for my family of 6! I would love to try the 4.5 cu. ft. Compact Refrigerator as an extra fridge in my den. I could keep drinks in it. I would love to have the Portable Party Cooler. I love how compact it is much smaller than what i have and I like the 11 functions.. I like the Magic Chef 3-Gallon Glass Bowl Convection Oven. Thanks. I like that this has Auto Defrost Modes by Weight or Time. I really want the 24-Inch Wine & Beverage Cooler, would be great for us cause we love our wine. I learned that it has not ten choices of power levels – it has eleven! I would love to have the 24-Inch Wine & Beverage Cooler. I like that it’s 12.4 inches high, that’s the PERFECT height for the area where we keep a microwave. Perfect! I like that it has 11 power levels! I’ve always wanted a coutertop ice maker, and they have some nice ones. Besides on of their microwaves I would love to have the 3-Gallon Glass Bowl Convection Oven. I like the ‘6-Place Setting Countertop Dishwasher’ – we do not have a dishwasher right now. This would be great. I like the 6.9 cu. ft. Chest Freezer! I want one of the wine coolers ! :) the stainless steel. I saw an appliance on their website that is completely new to me: The 3-Gallon Glass Bowl Convection Oven. Looks interesting, and I can think of lots of things I could make in it. I like the one touch cooking modes and the warranty offer. I like the Customize Cooking . I like the choice of 11 power levels. I like the 24-Inch Wine & Beverage Cooler. I like that the Magic Chef Microwave has an express cooking function. I like that it is stainless steel. I like the glass bowl convection oven.It would be fantastic to make my chili in! I like that I can Customize Cooking with the Choice of 11 Power Levels. Their compact washer and dryer would be great for my sister’s apartment. I would like to have the 3-Gallon Glass Bowl Convection Oven. I entered Sphero 2.0 | Robot | Smart Toy Giveaway. I learned you can buy this microwave at Walmart! I learned they have alot of different styles of Microwaves! I’d like to get the 4.9 cu. ft. Keg Cooler. I like that the microwave have 11 power level. They have 11 power levels! My current microwave won’t even pop 1/2 bag of popcorn – it’s a gazillion years old. 4.4 cu. Ft. Compact Refrigerator. I entered the Google Play giveaway. The 143-Can Beverage Cooler is really nice too. It would be nice to have a space for extra drinks for guests. Thanks for the chance. I love the 30-Lb. Portable Ice Maker. I love ice and this is something I will look into. I learned that this microwave has 11 Power Levels for cooking. I also like the 27-Lb. Portable Ice Maker. It would be great for outdoor parties and afternoon grilling dinner outside. Wow…. you can actually defrost based on the weight of an item. I want this! I love that it has 11 different power levels, this means you can cook almost anything in there! Thank you for the wonderful giveaway! THEY HAVE PARTS AVAILABLE!!!! I had no idea a microwave could be repaired. My family could use the 30-Lb. Portable Ice Maker for the summer months! I like the Magic Chef 27-Lb. Portable Ice Maker. I like the 1.1 cu. ft. Countertop Microwave Oven. Magic chef is an 85 year old brand! I like the choice of 11 power settings! Nice! I just like that it is stainless steel and you can easily clean it and keep it sanitized. I wouldn’t mind getting one of the Ventless Washer and Dryer Combos. I could use that. I like the Glass Bowl Convection Oven. I like that the microwave is small. We dont have a ton of kitchen counter space most of the time so smaller appliances is a must here. I like that you can customize cooking with the choice of 11 power levels!